With the establishment of the Paris Agreement on climate change the world has entered a new era of climate solutions. Political battlegrounds have shifted from debates around the existence and relevance of anthropogenic climate change to how to solve the problem. Yet, our scientific understanding of solutions remains patchy. While climate change assessments as undertaken by the Intergovernmental Panel on Climate Change (IPCC) have been successful in understanding the physical science basis of anthropogenic climate change, learning on climate solutions has remained limited over the last three decades. We still do not really know what climate policies work well under what conditions and why (Minx et al 2017, Berrang-Ford et al 2015) nor how to track progress over time and across contexts (Ford et al 2015, Lesnikowski et al 2016). This workshop intends to catalyze synthetic evidence on climate solutions for the upcoming IPCC Sixth Assessment Report (AR6). It aims to initiate a series of systematic reviews for an enhanced understanding of mitigation and adaptation options, i.e. what mitigation and adaptation policies and measures work well under what institutional conditions and why. Reviews will be collected for a focus issue of Environmental Research Letters. Provide conceptual and practical training to researchers to prepare them to conduct high-quality systematic reviews. Familiarize them with available IT resources. “Systematic review” refers to a whole suite of formal methods to aggregate evidence into discrete bodies of knowledge by reconciling evidence and understanding sources of variation in a rigorous way. 1) clearly defining the research question; 2) systematically searching defined literature databases for a defined time period; 3) justifying and making transparent sources and selection of the literature; 4) systematically assessing the quality of the selected evidence; 5) justifying and making transparent methods used to synthesize the evidence based; and 6) appraising confidence in the results (Berrang-Ford et al 2015). 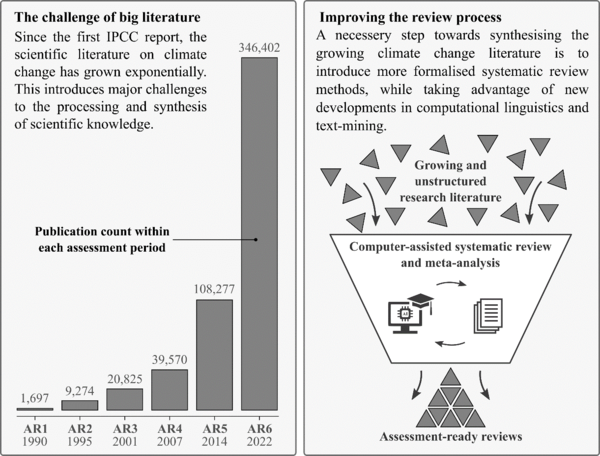 Berrang-Ford L, Pearce T and Ford J D 2015 Systematic review approaches for climate change adaptation research Reg. Environ. Chang. Ford J D, Berrang-Ford L, Biesbroek R, Araos M, Austin S E and Lesnikowski A 2015 Adaptation tracking for a post-2015 climate agreement Nat. Clim. Chang. Haddaway N R and Macura B 2018 The role of reporting standards in producing robust literature reviews Nat. Clim. Chang. Lesnikowski A, Ford J, Biesbroek R, Berrang-Ford L and Heymann S J 2016 National-level progress on adaptation Nat. Clim. Chang. Minx J C 2018 How can climate policy stay on top of a growing mountain of data? | Science | The Guardian Guard.